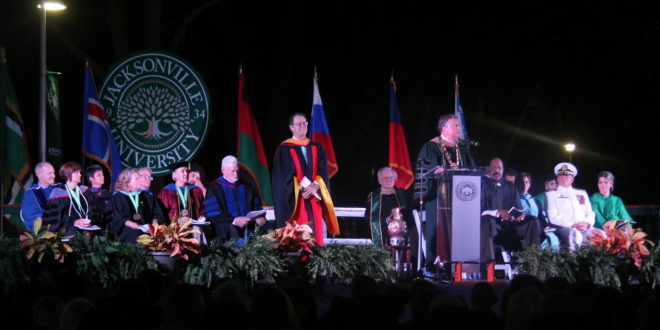 One of the strongest incoming classes in Jacksonville University history is being greeted by one of the strongest eras of investment in academic excellence, innovation and community involvement in the school’s history. An active summer of planning and continued enhancement of outstanding personnel and programs caps off more than $35 million invested in growth and improvement in recent years. 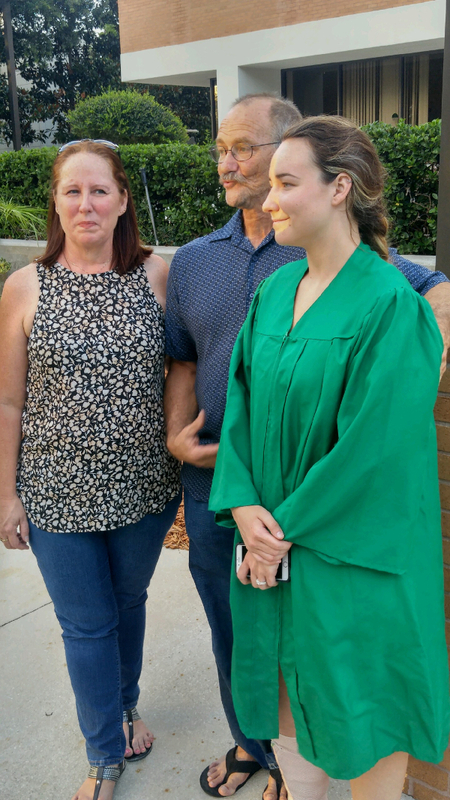 Malyssa Peabody of Fleming Island, a double major in marine science and music, attends matriculation with parents Geoff and Cheryl Peabody. As it puts its mission to become one of the finest higher ed institutions in the region into high gear, the University welcomed a diverse, academically gifted class of more than 500 students at an evening matriculation ceremony under the oak canopy of the Science Green. Dr. Donnie Horner, Senior Vice President of University and Academic Affairs/Provost, addresses the incoming Class of 2020. 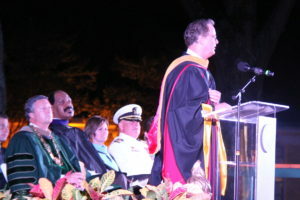 They heard from a distinguished panel of speakers including Cost; Dr. Donnie Horner, new Senior Vice President of University and Academic Affairs/Provost; Dr. Colleen M. Wilson, School of Education Chair and Professor of the Year; Capt. 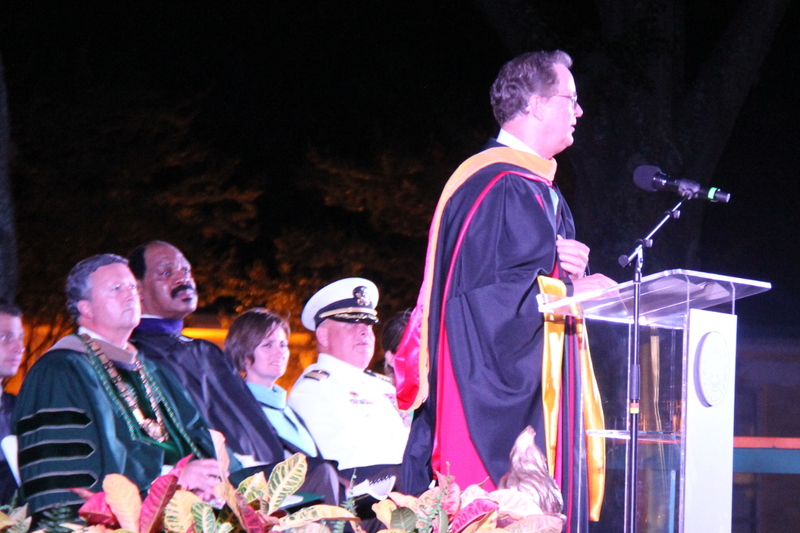 Neil Karnes, commanding officer for JU’s Naval ROTC program; and basketball legend and JU alumnus Artis Gilmore ‘71, who told the students he couldn’t imagine having attended any other school, and to make the most of their time here. The Class of 2020 includes students from more than 30 states, as well as Saudi Arabia, Nigeria, Jamaica, The Bahamas, Ghana, Canada, India, China, Ethiopia, Brazil, the United Kingdom and Mexico. Valedictorians, Eagle Scouts, national honor society members, military veterans, singers, dancers, scientists, student athletes of the year, social media experts, engineers, entrepreneurs and Jacksonville University legacies make up the group. The new students are joining in the legacy of a University now in its 82nd year and one that is adding new degrees to meet market demand, attracting and keeping the highest-achieving faculty, drawing even more research dollars and offering a small, private school living learning environment second to none. Dwayne Mattushik of Paramus, N.J., who was recruited to play lacrosse, agreed JU offers the perfect blend of academics, culture and social opportunities.